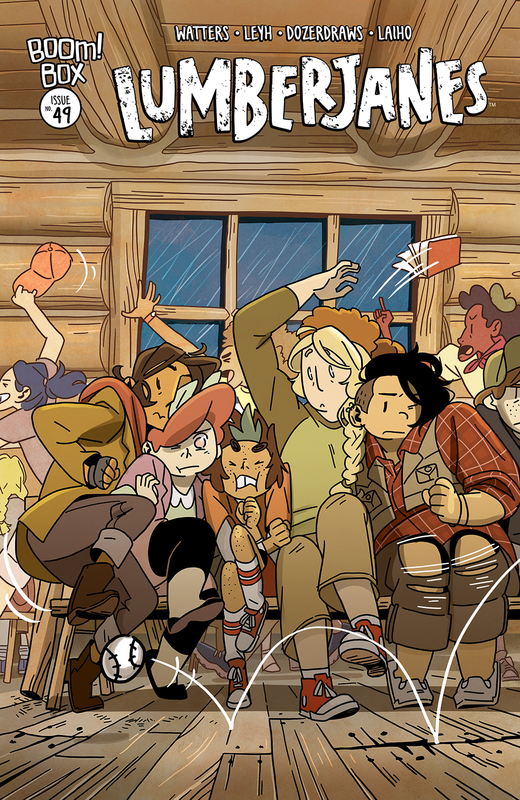 Thanks to the bad weather, all of the Lumberjanes are currently cooped up in the mess hall. Apparently they can’t use the Arts and Crafts barn due to a certain glitter related incident (cue the guilty look from Ripley), which I find endlessly funny. They’re all feeling a combination of stir crazy, bored, and antsy; which is not a good combination for this group. Thanks to this the counselors have been forced to create an approved (indoor friendly) activity list. Which is fair – I don’t see the campers coming up with safe ideas on their own. I got a glimpse of the list, and I’m not going to lie, a lot of stuff on it looks pretty cool. Even trapped indoors they appear to be having more fun than any of my summer camps ever offered. I swear I’m not jealous. April and Ripley, naturally, are looking for excuses to go outdoors. They even convince themselves that the storm has lasted an unnaturally long time (a whole seventeen minutes) and that they obviously must go an investigate the cause of it…which is where Jen steps in and makes them all promise they won’t go outside (no matter how badly they may want to go out – they would never break a sincere promise to Jen like that – though finding a loophole is totally acceptable). Thanks to the variety of activities most of the Roanoke cabin ends up getting split up. Molly is off to try knitting, Mal is going to a jam session (pretty cool, actually), April to origami, leaving Ripley and Jo to try and figure out what they want to do (they settle on yoga). However, the idea of snacks plagues April and Ripley too much, and they end up ditching everyone else to plan a heist in the kitchen. Shortly they’re joined by Mal (whose jam session was far too overcrowded to actually get anything done). Now all they need is a distraction and they’ll be on their way! In a cabin that crowded it really doesn’t take much time for a distraction to come up, leading the counselors by the kitchen door away and into the fray. April, Ripley, and Mal know better than to waste their chance. I actually have to say, I feel kind of bad that half of the cabin is being left out of this adventure, though it makes sense that the whole group wouldn’t be included every time. While our hungry campers are exploring the kitchens, the rest are having an okay time, mostly. Molly is actually a really great knitter, as it turns out. Then she and Jo get roped into trying out a new board game one of the other campers designed...and I do feel bad for them for that. The rules seem overly complex and tedious, and having to listen to them alone would probably be torture. I hope they end up having fun at some point during this whole mess. During their quest for snacks Ripley finds a trap door…in the kitchen. So of course she jumped right in without a seconds thought. The loud clank of the door pretty much force April and Mal to follow (it was that or getting caught by the cooks). Inside the secret trap door is a secret tunnel…inside a kitchen inside the Mess Hall. That doesn’t sound suspicious or anything. On the bright side, they’re technically still inside, even if they go exploring the tunnel…so they wouldn’t be breaking any promises (see, I told you loopholes were allowed!). This is an interesting start to a new plot. The Lumberjanes have always been very talented at finding trouble, especially in the most unlikely places. Their finding the absurdity in the mundane is one of the reasons why I like this series so much. As per usual the artwork is perfect for this series. Its bold lines and colors along with the simpler designs really suit the stories being told, but still allow for each character to be distinct and fun in their own way. The creepy crawlers shown at the end made my skin crawl, but I guess that’s a good thing?